Encourage Others and Say, "In All You Do, BE the Blessing," in More Than 100 languages. Different ways to say, "In All You Do, BE the Blessing." CUPERTINO, CA (PR Buzz) – February 20, 2018 – – A blessing becomes bountiful when shared. It isn't always monetary, and it isn't always the material things. It could be in the form of time or effort. In all you do, be the blessing. We all have the capacity to help, no matter what mental state we're in. A little act of kindness could change a life forever. Linda Stirling is an international bestselling author. Using her refined strategies, she coaches writers on how to create long-term, life-affecting income from their books and the opportunities that can arise from being an author. Her programs give writers the tools they need to get visible and stay visible, so they can entertain, motivate, inform, or inspire others. Her publishing house, The Publishing Circle, is described as "embracing a new paradigm in publishing" because of the higher royalties and ongoing book marketing, among other differences. Let everyone be reminded that we can be a blessing to others in our own little ways. Have a bigger reach and share the URL, http://aha.pub/BEtheblessing. 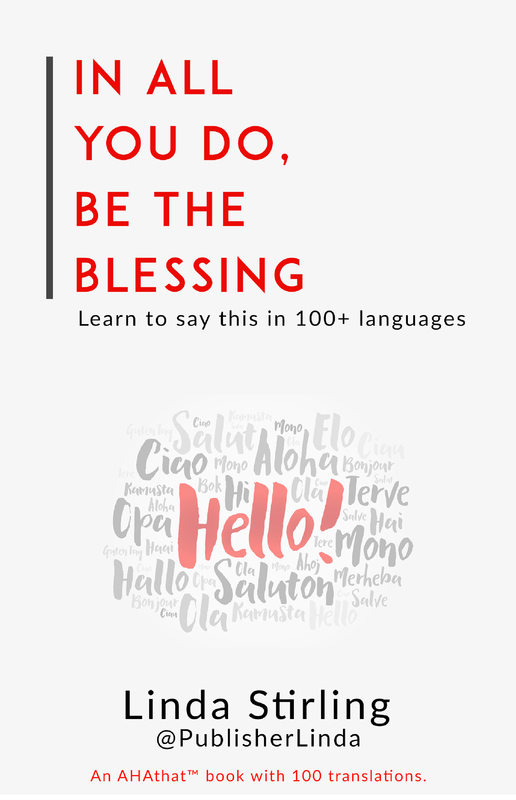 This new AHAthat™ phrasebook, "In All You Do, BE the Blessing," comes with over 100 unique translations. "Spread some love and facilitate kindness. For it is only in sharing/giving, where one finds pure joy," says Mitchell Levy @happyabout, The AHA Guy Thought Leader at AHAthat (http://AHAthat.com). This AHAbook has over 100 translations of the phrase, “In All You Do, BE the Blessing.” Inspire others to be the blessing by sharing this via http://aha.pub/BEtheblessing. You can also check out other amazing phrasebooks here: https://www.ahathat.com/Phrases/. AHAthat makes it easy for you to establish your expertise, whether it's by sharing high-quality content of thought leaders from around the world or by quickly creating a thought leadership book of your own. AHAthat allows you to write your book in eight hours or less, or we can ghostwrite it for you after a two-hour interview. There are over 40k AHAmessages from recognized AHAleaders that you can share in seconds, for free. All content on the platform is curated by THiNKaha, which has published over 800 physical and eBooks. THiNKaha makes it easy to create compelling content that helps turn corporate experts into recognized thought leaders. THiNKaha Services include: Curation for AHAthat, Thought Leadership Mentoring/Coaching, Book Publishing, Social Media, Traditional Media Coaching, Vetted Referrals, Producing and Repurposing Content for Shows like ThoughtLeader Life, and many other Thought Leadership Services, including the Creation and Support of Corporations' Thought Leadership Blueprints. To have us help your corporation amplify its thought leadership, please contact Jenilee Maniti at jenilee.maniti@thinkaha.com or cal (408) 257-3000.